A sweet, mostly vegan collection of chocolate treats from the founders of Not Your Sugar Mamas. You think you love chocolate, but do you know how much you could actually love it? In Chocolate Every Day, Bennett and Ky show chocolate for what it really is: a delicious and incredibly potent, antioxidant powerhouse filled with vitamins and nutrients. Their decadent recipes do away with the refined sugar, dairy, and gluten found in traditional chocolate treats, and instead rely on raw cacao and high-quality, unprocessed ingredients to create snacks and desserts you can actually feel good about eating. By combining raw cacao with organic, natural sweeteners, nutrient-rich fats, and superfoods like maca and lucuma, Bennett and Ky's delicious treats pack a real health punch--and are as decadent as their traditional counterparts. Filled with tips and tricks for deciphering chocolate certifications and labels, a guide to building a superfood pantry, and more than seventy-five recipes for delectable and irresistible sweets, like Fudgsicles, No-Bake Thin Mints, Mexican Chocolate Cashew Milk, and Crunchy Salty Peanut Butter Chocolate Tart, Chocolate Every Day will give you more reasons than ever before to indulge in this beloved flavor. Bennett Coffey and Kyleen Keenan are the cofounders of Not Your Sugar Mamas, a holistic chocolate company based on Martha's Vineyard. Both are graduates of the Institute for Integrative Nutrition and certified holistic nutrition counselors. Not Your Sugar Mamas has been featured in Well+Good, Vogue, Real Simple, and The Boston Globe. "When I opened this gorgeous book I thought to myself...Am I dreaming?! Every recipe is absolutely drool-worthy, and I want to run to the kitchen to make each one. 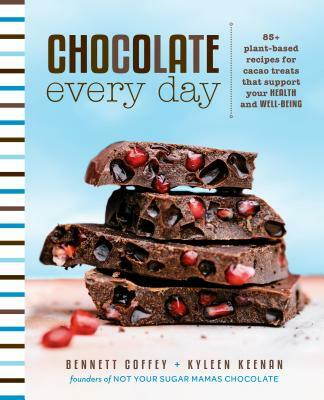 I love that Bennett and Kyleen show us how to make chocolate wholesome and healthy without sacrificing flavor—you’ll be inspired to cook (and taste) your way through this entire book!"